THE STORY - The Soviet dictator lives out his final days, and chaos erupts after his death. ​​What would happen if the characters of “Veep” merged with some of the world’s most monstrous leaders? That’s what we get in Armando Iannucci’s “The Death Of Stalin.” It’s easy to imagine Stalin and his people as these imposing villainous masterminds. We, of course, know the atrocities that occurred in that regime. But maybe they were just bumbling evil idiots desperate for power. At least, that’s what “The Death Of Stalin” imagines. The film begins in 1953 on the night of Joseph Stalin’s death. He’s still at the height of his power, ruling a country living in fear of their leader. Everyone is desperate not to say or do the wrong thing, getting their name on a “list.” Those in Stalin’s inner circle, the Central Committee, go to great lengths to please Stalin, laughing at his jokes, telling him what he wants to hear. Still, even those who are allies of the leader find themselves on a list to be killed. Of course, it’s not long before Stalin himself drops dead from a cerebral hemorrhage. After he’s discovered dead, the Central Committee gather to figure out what they’re supposed to do now. This material isn’t easy to pull off. On one hand, it’s a political drama showcasing this great struggle for control of a world superpower. On the other hand, it’s fast-paced humor and quick wit. Thanks to smart writing that deftly threads the needle, the tone works perfectly here. The film never feels like it’s giving a pass to the characters for how evil they truly are. We really don’t sympathize with them for a moment. This also doesn’t really give us any character to root for, cause we want them all to go down in flames. An excellent cast helps sell this strangely hilarious blend of tones. Steve Buscemi is menacing, conniving, and still as funny as ever as Nikita Khrushchev. Simon Russell Beale is especially dark and reaching for control as Lavrentiy Beria. His pitch black performance is the highlight of the film. In his first role since being ousted from “Transparent” over sexual assault allegations, Jeffrey Tambor plays Georgy Malenkov. He captures the bumbling and frantic spirit of the character well, even as he’s being controlled by the rest of the Central Committee. Others, like Jason Isaacs, Andrea Riseborough, and Adrian McLoughlin shine as well. All the characters have a wide range of accents not even trying to sound Russian. Some are American, some British, and some Cockney. It gives the movie an inherently silly vibe, aided by the dramatic slow-motion introductions that each character receives. With a constant stream of one-liners and witticisms, the film can feel a little exhausting. The film is basically one extended joke, that these four men (and more) are a bunch of morons of varying wickedness who want to rule the nation. Still, there’s some great material there, and it all hinges on the perfect delivery of this sharp script. They’re all depraved and childish men, constantly suspicious and ready to expose the others for who they really are. There’s sabotage, murder, and more. It’s often easy to laugh, though the periodic reminders that these men committed heinous acts in the real world make the laughs feel a little odd. Though this has plenty of wit, it feels depressingly grounded in our current political climate. The film never needs to give overt references to today, it’s easy enough to read into the bumbling, power-hungry characters. This is what great satires do: make us laugh while giving us glimpses of our own reality. 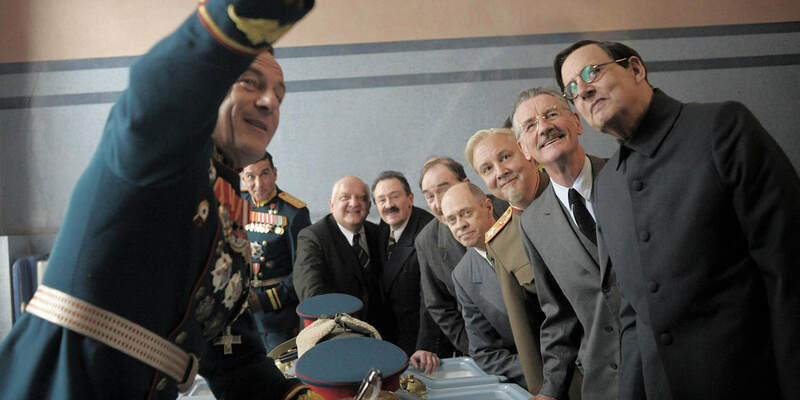 “The Death Of Stalin” is a truly funny and absurdly smart film.